I am finally getting a start on restoring my 1973 PlayPac. I bought my playpac back in 2009 and finally have a start on it! Oh yeah, this one doesn't have the glass dome ... so far the only one I've seen without it. I've been using the trailer to store items and move some things around. Its fully registered and has new rubber and tows great. But now its time for a complete frame-up restoration and return to camper glory. Interior is fully removed ... I have all of the original interior parts except fridge. Besides the floor repair, my biggest challenge is repairing the door. The door is removed because the door frame (inner frame holding door itself) is completely broken. I've noticed that the windows have the same frames and radius corners as the door. I would like to keep all of the original windows, but I may need to sacrifice the front window in order to use the frame material to repair the door. Does anyone know who the window/door mfg is? 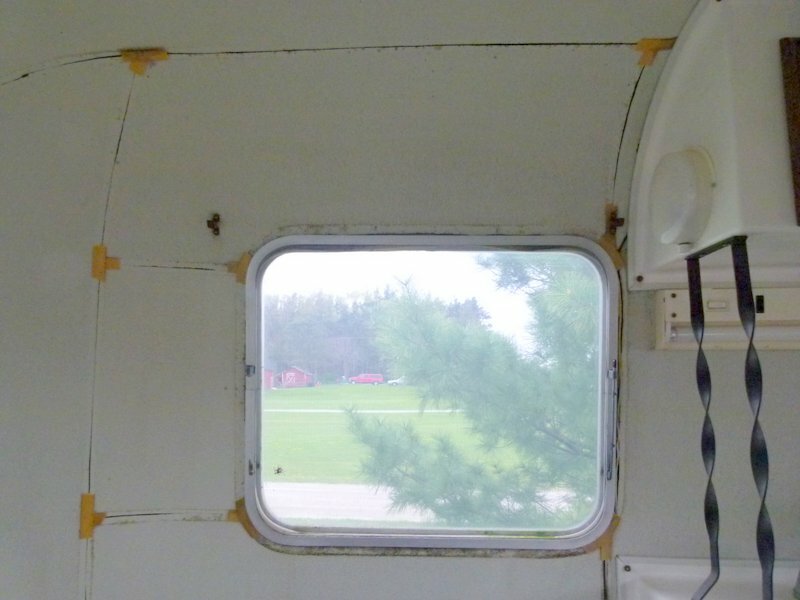 I'm hopeful that maybe I will be able to identify the same frame material used on other RVs/windows that I could scavenge, and thus avoid having to sacrifice one of the original windows? Older scamps have similar tilt out windows... any chance the frame is the same? The Playpac windows appear to be made by "Creation Incorporated". There was a company "Creation Windows" still in existence until recently ... same maybe? Check this out: It appears as though the same windows were used on some Love Bug and 70's Scamp trailers, possibly others ... check out the pics. Same windows as the PlayPac? Yep. Does anyone have one of these windows for parts? I'm convinced that there are frame pieces still out there somewhere! The PlayPac inner door frame is made from the same aluminum frame as these windows, radius and all. I'm looking for this frame material from one of these windows to repair my door frame. Great work Chris - yep those are the same windows and hardware! It's good to know they were used in other campers which increases the likelihood of us being able to find parts. Unfortunately, the door will be a little bit tougher since they seem to be pretty specific to the Play Pac. There has a to be a way to find someone who does welding who might fabricate a frame using the existing framing as a guide? I am glad to see you launching into a full-on reno since I am sure there will be a lot we can all learn with you on the way. I am trying to finish up my mini-reno, it's not a complete gut job like yours but I was lucky enough to have only a few things I wanted to change. There are plenty of shots of Play Pacs but if there is anything I can offer for help, let me know. Keep, us posted if you learn anything else about your door fix and window parts. I wish you only the best of luck! I have a 76 or 77 Scamp with a rear window metal frame that I think is the same as the 76 Scamp tilt out front window picture. PO had removed the inner part of the frame and and attached a solid piece of plexiglass to the frame. If I get to it my plans were replace the frame with a rubber gasket. The camper is about a two hour drive away, I might go that way in about a week, I will check it out then. BTY, One of my first FGRV campers was a Play Pac. Unfortunately, the door will be a little bit tougher since they seem to be pretty specific to the Play Pac. There has a to be a way to find someone who does welding who might fabricate a frame using the existing framing as a guide? Yeah, I doubt I will be able to find an existing frame piece with the same dimensions as the PlayPac door (that would be awesome! ), but I really just need some of that frame material to repair the existing frame for it to be right and still function with the T-bulb style weather stripping. I will need to replace the top 2 radius corners. With the right pieces (from one of these old windows), I might be able to rivet the door and frame back together solidly and have it look good too. I also need to replace the piano hinge and will be removing the entire door frame & windows for restoration & re-sealing. Fabricating a new frame is an option if I can find someone who can make the U-channel radius bends. Anyone know about radius bends in aluminum u-channel? Something maybe a company like Hehr could do? I dunno. Going this route would also require different weather stripping, maybe a D-shape adhesive stripping. Could fab new door frame with the right channel? Looks like it has potential. I went by and looked at my window frame. The extrusion might be the same but the window radius is bent in the other direction. The U channel is on the outside of the radius on mine. Thanks for checking Eddie ... I've ordered some 6063 aluminum channel pieces for making test bends to see if fabricating a new frame will be doable. (I'm optimistic!). Update in a few days ... I'll prob start a new thread to track the project. I'll prob start a new thread to track the project. Way to take this one head-on Chris. I was working at a home restoration project last weekend and the electricians were using pipe benders to get nice 90* angles on the conduit they were installing on a very old house. It looked fairly simple and I know they sell these pipe benders at Harbor Freight relatively cheap. I went to YouTube and saw dozens of examples of 'how to' bend aluminum conduit as well. Seems like you already know what you are doing so maybe none of that is of use. Anyway, I look forward to your results and hope its easier than it is harder! Nice find. It looks like only the square windows - would be cool to find the side ones with the additional corners. I was checking out the gallery and can't be certain but it looks like the Beachcomber might have a similar door? They don't have the piano hinges that ours have, they have the freezer door hardware that many others use, but if the shape fits it might offer additional hope of a door replacement. Look at all that PlayPac door frame material Looks like more than enough just on an Amerigo go build several PlayPac door frames!